Hey there She Speaks Attendees! I wanted to thank you for attending my session on How Social Media Makes You a Better Communicator. I so wish we’d had a longer time together to practice. Or that I could have spent some one-on-one time with each of you. Since that wasn’t possible, I wanted to show you an example below of taking a broad concept and boiling it down into a “sticky statement” that a reader would be likely to highlight in their book or to grab and put on their social media. Remember, when crafting social media posts, try to paint a picture and evoke emotion. I use visualthesaurus.com when I need to find a strong verb or a really great descriptive adjective. Sometimes when you are dealing with a relationship of someone close to you and there is conflict, you feel like lashing out at the other person, using angry words as you do. You know you shouldn’t behave this way but it just feels good in the heat of moment because you are so terribly upset. Later, however, you might have feelings of remorse because your words have wounded the other person and you wish now you could take them back. But it’s too late. The damage has been done. This paragraph is 89 words 480 characters long. To put this on Twitter would take four tweets. 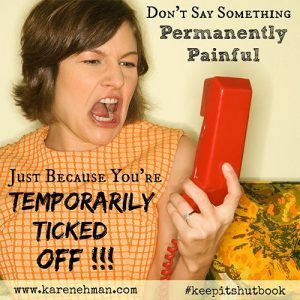 Don’t say something permanently painful just because you’re temporarily ticked off. This highlightable sentiment is only 11 words and 83 characters long. It is tweetable with one tweet. There is even room to add a link or an image. In a book, it would be called a “pull quote”. An editor might not only leave it in the body of the chapter, they would pull it out to be on a sidebar in a larger font as well. There you have it. Praying for you as you learn to use social media to hone your craft and make you a more effective communicator. COMPEL Members: If you’re a COMPEL member, you can also access my training: How to Be “Like”-Able. Not a COMPEL MEMBER? Be sure to sign up for updates here to be the first to know when registration opens. You’ll also receive our free PDF: Confessions of a Publisher: 3 Things The Top Christian Publishing Want You to Know.